Barilla sponsored this post, but the opinions are my own. 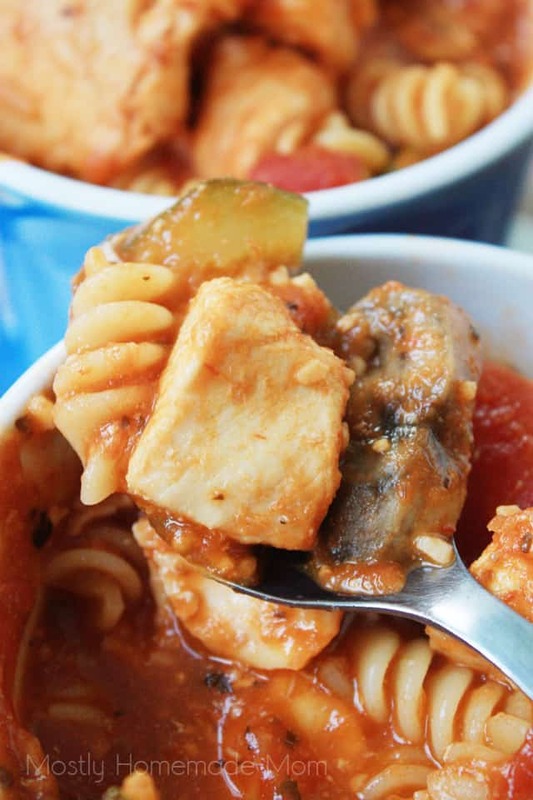 This Chicken Cacciatore Stew is perfect for busy weeknights! 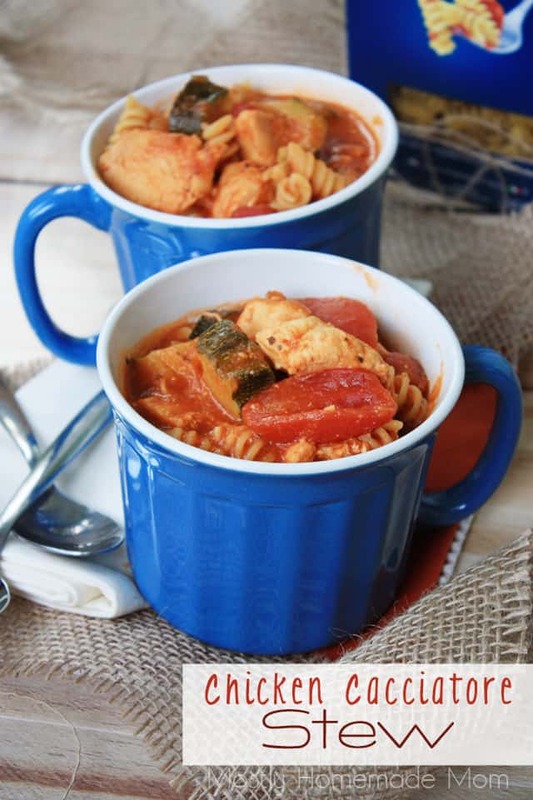 Sauteed chicken with tomatoes, zucchini, sauce, and rotini make this a fun dinner for kids, too! Busy weeknights during the school year can be ROUGH in this house! I’ve tried and failed to figure out exactly what triggers all of us into being really snippy at each other during this time of day. I honestly think it’s a huge combination of a number of factors. 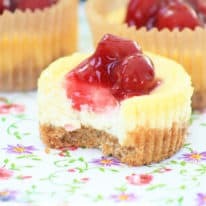 The kids are tired from a full day at school, I’m tired from a full day of working at home and taking care of toddler Reuben, Paul is tired from a full day of work at the church, and to top it off – we’re all getting hungry. It’s really a recipe for disaster, if I’m being honest! 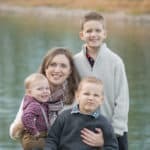 Luckily, the boys don’t get much in the way of homework – so at least that one less challenge that we have to deal with on a nightly basis. 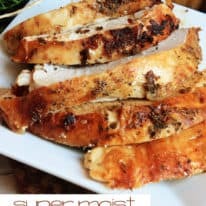 I’m pretty much always on the lookout for simple, easy dinners that incorporate some great grains, proteins, and veggies in a really tasty way. 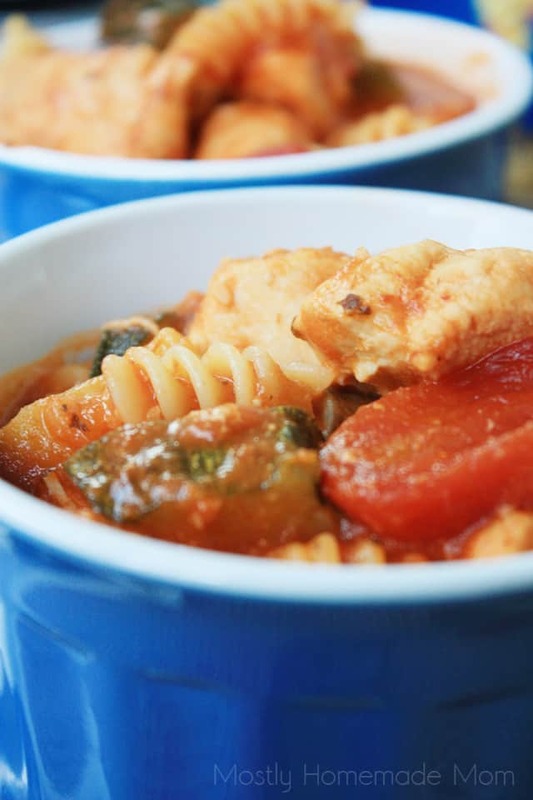 My kids really loved this Chicken Cacciatore Stew, specifically for the rotini pasta. They love the swirls – it’s their favorite! 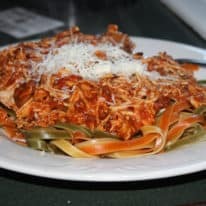 This easy dinner was perfect all on its own, but you can certainly top it off with a little grated parmesan cheese and some fresh basil to complement the flavors of the sauce. I really love how filling this meal was, and we were able to pack four plastic containers of leftovers for us to grab quick on the way out the door in the morning for lunch. Sure beats a lunchmeat sandwich during the work week! Heat olive oil in a stock pot over medium heat. Add chicken pieces and saute until almost cooked through. Add minced garlic and cook for 1 minute. Add in 3 cups chicken broth, sauce, tomatoes, zucchini, and mushrooms. 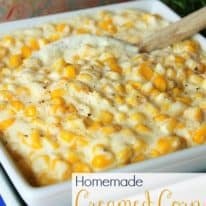 Bring to a boil, then reduce heat and simmer for 25 minutes. Stir in remaining 1 cup broth and uncooked rotini. Cook for 7 – 9 minutes or until pasta is done. Allow stew to cool slightly before serving. 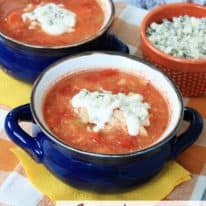 This stew is really a great way to get your family eating some vegetables in a new and delicious way – the zucchini really soaks up the wonderful flavor of the sauce. 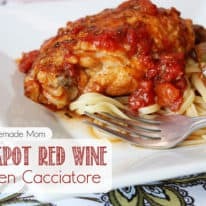 You really need to put this Chicken Cacciatore Stew on your menu plan soon, I’m sure your family will go crazy for it just like my family did! 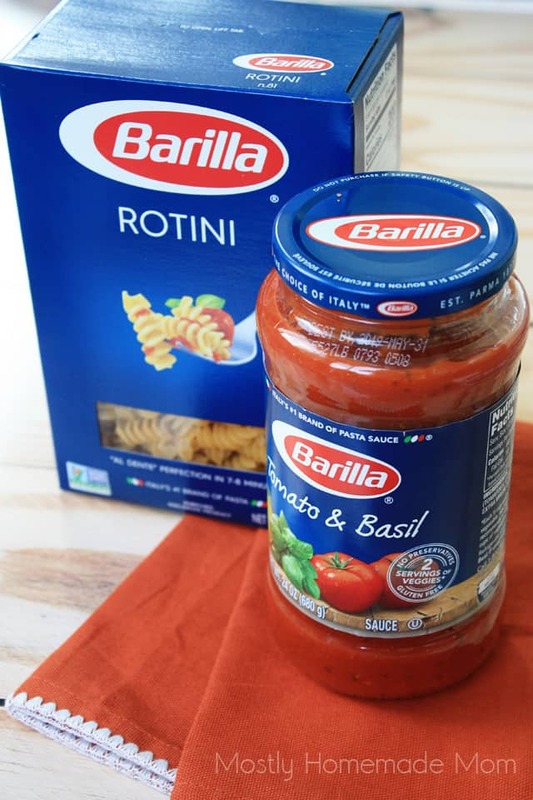 I love being able to pick up our favorite Barilla Tomato Basil Sauce and Rotini during my regular grocery trip through Walmart during the week. Their Tomato Basil Sauce has simple ingredients, no preservatives, and is gluten free. Barilla Rotini Pasta has a lower glycemic index, which keeps you fuller longer, and is made with non-GMO ingredients. Barilla has again partnered with the No Kid Hungry organization this year! For every box of Barilla Blue Pasta purchased at Walmart from 8/10/17 – 10/31/17, Barilla will donate $1, up to $50,000. That’s enough to provide a meal for 500,000 kids in need. 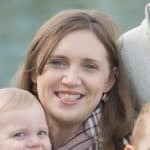 Such an awesome organization and company that I am proud to promote here on Mostly Homemade Mom! 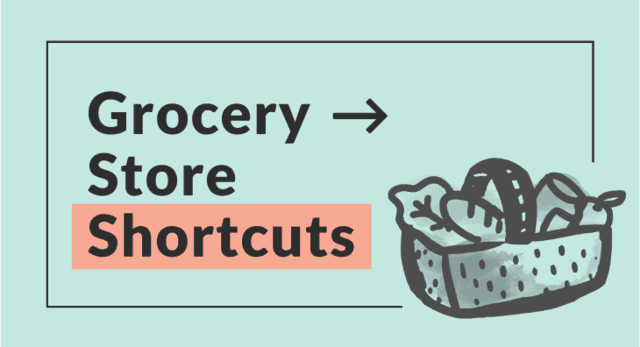 Click here to learn more about No Kid Hungry.